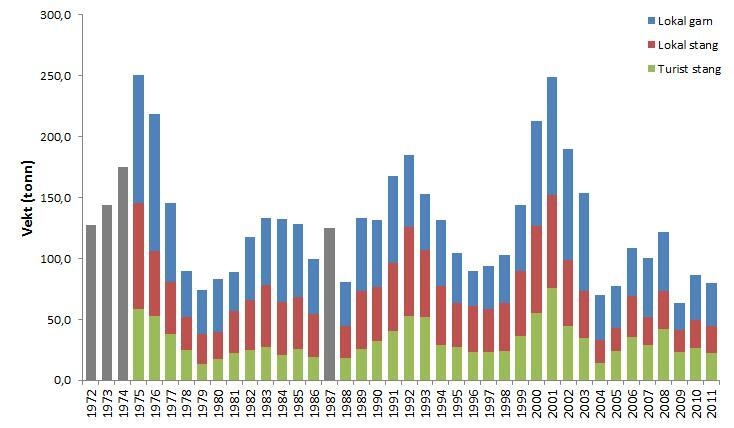 Figure 1 shows the total reported catch of salmon in the Tana River from 1972 until 2011. The statistics illustrates the capture of a number of different of salmon stocks in the river and of different size classes of Atlantic salmon (small-salmon, mid-weight-salmon and large-salmon). Catches vary widely, from a maximum of 250 tons in 2001 to a minimum of 63 tons in 2009. Average annual total catch in the period is 130 tons. During the top years (1975 and 2001) the catch in Tana River contributed up to 40% of the total catch of salmon in Norwegian rivers. Catch distribution in the Tana River were in the early 1970s divided between Norway and Finland with roughly 60% caught in Norway and 40% caught in Finland. The catch distribution has changed gradually and today, about 45% of the total catch is done in Norwegian territory and about 55% is done in Finnish territory. Figure 1: Norwegian and Finnish catch of salmon from 1972 to 2011, showing total numbers on catch by visiting anglers (tourist bar), local rod and net fishing (local bar and local yarn). The gray bars illustrate years where the data collected does not show the division of catch by catch instrument. Source: Finnish fishing, wildlife and fisheries research station in Utsjok (RKTL). Norwegian catches from 1972 to 2010, the County Governor of Finnmark, year 2011, The Tana River fishing management. The total catch of salmon in the Tana River is distributed differently in Norway and in Finland when considering the usage of different fishing-equipment and the origin of the fishermen. Note that the statistics are affected by the fact that the regulating laws in both Finland and Norway limits the time periods in witch the varying fishing tools are legal to use, and how long the legal fishing season is for locals and tourists. In the period 1972-2008 about 50% of the total Norwegian catch was done by locals with different kinds of fishing-nets. On average, about 10% was done by visiting tourists, while 10% of the total catch was done by locals using fishing rods. In the same period almost 75% of the total catch at the Finish side of the boarder was done by angling, with visiting tourist-fishermen doing the larger part; 44% of the total catch. 30% of the salmon caught in Finnish territory was caught using various net-tools. During the time between 1972 and 2008, 42% of the total catch for both Norway and Finland was done by net-tools while the remaining 58% was done with fishing rods. Figure 2: Distribution of salmon caught by different fishing methods in Norway, Finland and the total for both countries in the period 1972-2008. Source: Scientific Council for salmon management.